Freakishly smooth footage. Smart-capture superpowers. Battletested and waterproof without a housing. This is HERO7 Black, the most advanced GoPro ever. With HyperSmooth stabilisation, you’ll get gimbal-like video – without the gimbal. A new intelligent photo mode delivers the best, most brilliant images automatically. And now with live streaming and the GoPro App, you can share every amazing moment as you live it. HERO7 Black takes GoPro performance – and your photos and videos – to a whole new level. 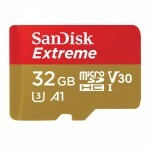 Also includes a 32GB Micro SD card.